Vietnam is one of the most enchanting destinations Southeast Asia has to offer. Located on the Indochina Peninsula, it covers a total area of approximately 127,880 square miles, which are filled with lush forests, rolling hills, 2,025 miles of coastline, and a maze of rivers and canals. With its diverse terrain, Vietnam is a land of stunning natural beauty and colourful culture which are perfect for a landscape beauty and culture honeymoon. From the North to the South, there are top cultural and heritage destinations to plan your lifetime trip in Vietnam. 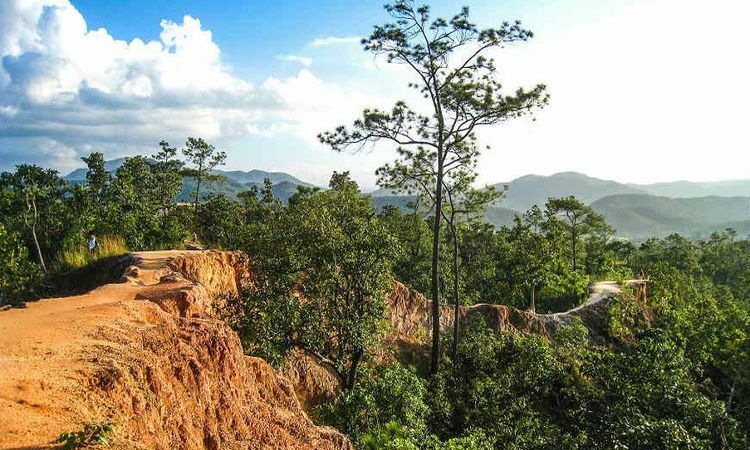 If you are looking for nature at its purest and a peaceful wilderness excursion on your trip, you should consider the 5-hour trip from Hanoi to Ba Be National Park. Nestled among the seemingly endless mountain ranges of northeast Vietnam, Ba Ba Lake likes a crowning gem. For lovers of geology and Earth’s history, Ba Be is a vast 450-million-year old terrain, littered with limestone karsts and special tectonic characteristics. Whether it’s the dry or rainy season, the water is always a beautiful hue of transparent-green, much like the mountains and trees. The most romantic activity to do here is taking a cruise on a boat. On the magnificent and tranquil lake, the only sound you will hear is your paddle tapping gently into the water. If you are lucky enough, you might hear a sli (a folk song of the Tay ethnic people) sung by a Tay girl with passion in her voice. In such a vast and majestic environment, you might wonder if you’ve wandered from reality into a dream world. Located 230 miles from Hanoi, Sapa is an ideal choice for a getaway from Hanoi as well as a leisure base for exploring the surrounding attractions. It is also considered as one of the most romantic destinations in Vietnam. You will be delighted with the unique culture of ethnic groups, admire the 3143m Fansipan mountain - the peak of Indochina and stunned by its amazing rice terrace fields - one of the 8 most breathtaking rice terraces in Asia when it turns from green to yellow color in September. Although the town is packed with lots of hotels, I highly recommend Topas Ecolodge - a remarkable place if you want to slow down to enjoy every second of life. 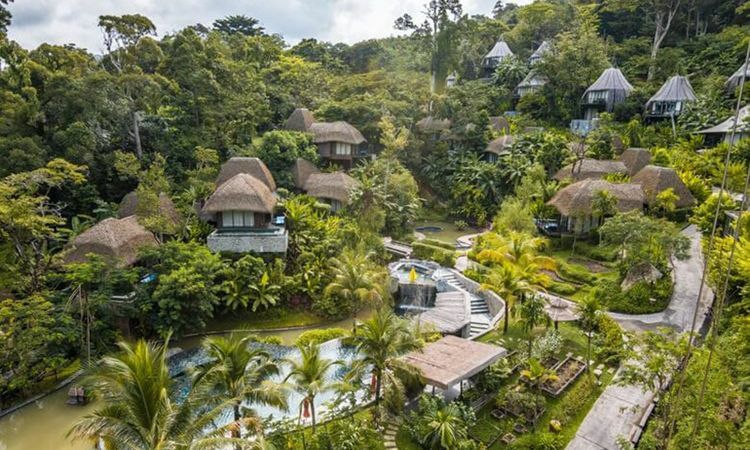 And just a few steps from your cozy bed to the private balcony, there is a magnificent view of rice terraces and towering peaks wrapped by the cloud. A gilded backdrop for you and your loved one to enjoy. Of course, it's an imperfection if not mention its amazing pool - one of 10 hotels with stunning pools in Vietnam. 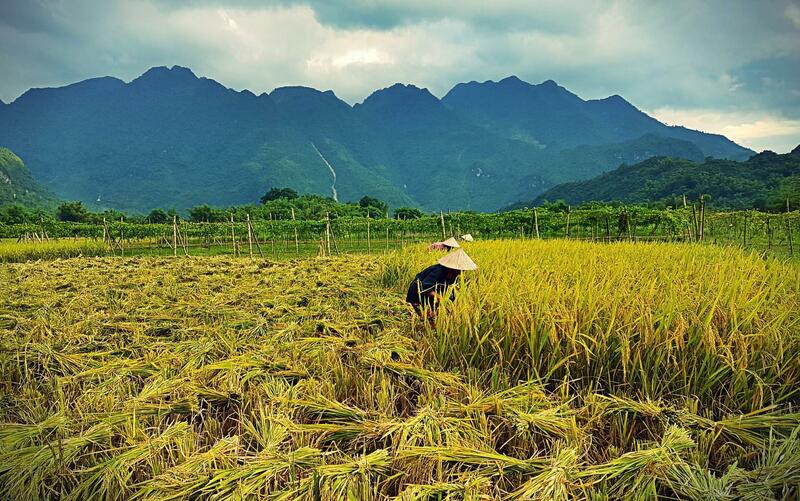 Not as far as Sapa, Mai Chau provides some idyllic rural views of beautiful rice fields, relaxed buffaloes, bare-foot children, and friendly locals working in the fields. The best way to start your day is to enjoy a leisurely bicycle ride through the rice fields. Stop anywhere you want between the green fields, breathe in deeply the pleasant scent of fresh air, let the breeze caress your face and a few playful blades of grass tickle your feet. For a moment, you’ll recognize that, whatever you do, with the right person, you don’t have to work so hard to be happy- simply enjoy the splendid, natural present. 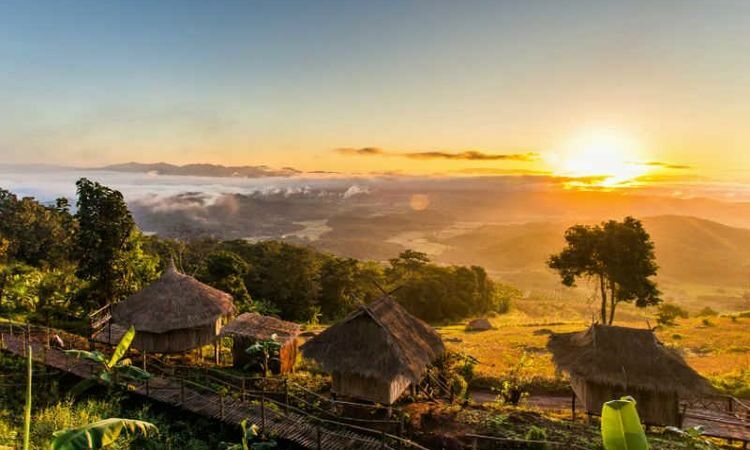 Mai Chau is completely different from hectic cities. This is the place where you can forget all the tiredness and worries of the everyday life to immerse in the idyllic rural life with your spouse. Staying a night in Ban Lac village is another unique experience. 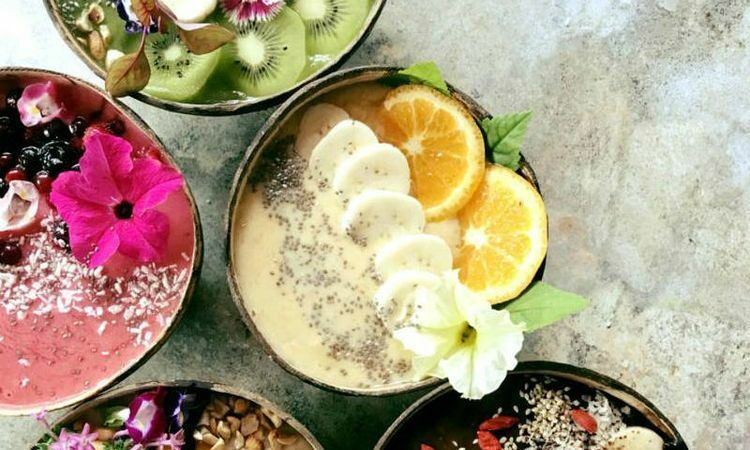 You will have a chance to join the village community, have dinner, and enjoy the culture before taking a well-deserved rest in the house’s private room. The mountainous temperature usually drops to a few degrees at night, but you’ll be warmed up in the arms of your spouse and sleep among the soothing sounds of nocturnal wildlife and gentle breezes. Just 4 hour driving from Hanoi, this beautiful natural wonder is well-known worldwide. This extraordinary area was declared a UNESCO World Heritage Site in 1994. With a wide range of biodiversity, thousand limestone islands, this surrealistic destination was the scene of famous movies like Indochine (1992), and Skull Island (2017). This surrealistic destination was the scene of famous movies like Indochine (1992), and Skull Island (2017). Take a trip on the Emperor - a luxury cruise - to blow your mind with stunning sceneries. Each suite is inspired by the royal lifestyle. That means you and your spouse will experience lavish nights and royal treatment on your trip. The Emperor has only 16 spacious, elegant, and luxurious cabins. Therefore, you will always find a private place to immerse yourselves in private romantic moments, especially watching the first rays of sunshine rising over the bay. 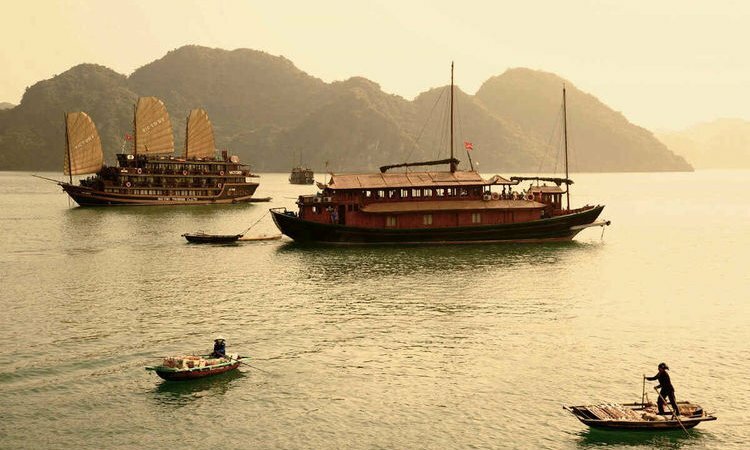 You will soon understand why Ha Long is considered as one of top 6 most romantic destinations in Vietnam. Nha Trang is a beach city, on the South Central Coast of Vietnam. The capital of Khanh Hoa province is well known for its beautiful beaches, tropical islands, and scuba diving. It is also home to ruins of the Champa Kingdom, Buddhist temples, gothic Catholic churches, natural hot springs, salt fields and unique waterfalls. If you want to delight your beloved with fine dining in a truly unique way, head to the Six Senses Ninh Van Bay, Nha Trang - one of best 10 hotels for soul treatment. This resort offers dinner in The Cave: a special setting for a very intimate dinner. The ambient lighting and the cozy atmosphere set the tone for a special occasion while top-notch food pleases your palate. This is surely an experience to be remembered for years to come. A night at Ninh Van Bay will provide experience to be remembered for years to come. Hoi An is a magical and atmospheric destination, unlike anywhere you can imagine. It’s a town with a quiet, laid-back ambiance with some delightful little shops and restaurants, which is perfect for lovers. There are many interesting things to do in Hoi An but the best way for a couple is discovering the town on a bike. Cycling will take you through famous attractions then connect you with local families and their everyday activities at the little Tra Que village. Here you can visit the herb gardens, immerse into the countryside, talk to the farmers, and learn to row a traditional bamboo basket boat. Hoi An is a town with a quiet, laid-back ambiance with delightful little shops, makes it perfect for lovers. If you come to this town on the full moon, you will see it transferring magically. From 7-9pm, people turn off the light and hang colorful lanterns to illuminate the whole old town. That is the right time to walk into the magic. Buy a paper lantern which is sold along the Hoai River, lit a candle, and make a wish for your lasting love before releasing it into the water. Your wish will come true - a miracle that Hoi An gives to you. Make your wish come true with the miracle of Hoi An. No city in Vietnam boasts as much historic charm as Hue. This is also the first site of Vietnam was named as a Cultural Heritage Site by UNESCO in 1993. 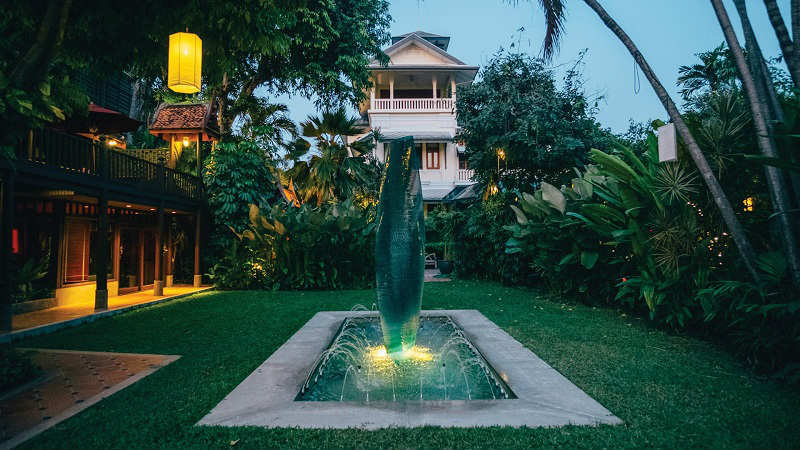 Hue’s dreamy and poetic beauty comes from the Ngu Binh Mountain, religious centers, royal palace to the Perfume River running through the city. The most attractions here is the Imperial City - the most massive structure being built in the history of modern Vietnam, Perfume River, the tombs of the Nguyen Emperors. Each of these is a stunning example of the rich architecture in harmony with the beautiful landscape. Walking these storied gravels, both of you will feel as if you have slipped back in time to 1800s when Vietnam was still ruled by the Nguyen Dynasty. On 23rd June 2014 in Doha, the Trang An Landscape Complex was declared as a UNESCO World Heritage Site - the third site of Vietnam inscribed in the list. Known as Ha Long Bay of the land, Trang An’s mountain system has experienced at least 250 million years in various geological states of orogeny and massif of giant karst limestone. But the difference is, these mountains are connected by rice fields, not water as Ha Long’s. With its special formation, you can make a circle journey by boat to visit all the beauties of Trang An. You’ll soon understand why this was chosen as movies’ scene of King Kong- Skull Island (2017) and Pan (2015). 31 lakes and lagoons are connected with each other through 48 discovered caves. Each lake looks like a poetic picture with brilliant colors of yellow rice fields, green forests, and white soft cloud, making this place surreal and spectacular. Step by step, you’ll feel like you are hand in hand, heading into a dreamland of beautiful heritage and nature. The Mekong River Delta covers about 15,444 square miles of rivers, swamps, and islands. This area used to host busy trading ports and canals as early as in the first century AD but nowadays, the Mekong River Delta is the most productive region for Vietnam’s agriculture and aquaculture. You will need at least a day to truly appreciate this attraction on a cruise. A cruise tour is easy to book near Saigon or Can Tho - a town in the heart of the delta. Cruising the river gives you a chance to visit vibrant floating markets, old Khmer pagodas, orchards, and villages surrounded by lush rice paddies. You can also hire a rowboat to explore Tram Chim National Park to witness the Sarus cranes and Tra Su Mangrove Forest - the home to an astounding number of wading birds. Declared a UNESCO World Heritage Site in 2003, the remarkable Phong Nha-Ke Bang National Park has preserved the oldest karst mountains in Asia, estimated to be approximately 400 million years old. The 300-caves system and spectacular underground rivers give this site a strangely beautiful and alien world for intrepid travelers. Here, you can take a boat tour up the river to visit Phong Nha Cave - the longest cave in Southeast Asia- to observe the underground river system. Or, if you prefer to avoid the water, you can trek the Paradise Cave: the largest dry cave in the world. After its namesake, this cave has a surreal beauty and spectacular limestone formations that give it the feeling of a primordial paradise. You can explore the park’s 300 square miles of forests- an absolute must for naturalists. This tropical woodland has 100 types of mammals (including rare species of primates, as well as tigers, elephants, and saolas), 81 types of reptiles and amphibians, and more than 300 varieties of birds. This astonishingly diverse and lush park boasts some of the most impressive wildlife and natural wonders in Vietnam and is a must-see for nature-lovers of all sorts. Just like its name, Paradise Cave boasts some of the surreal and spectacular views.